A Black Bear clings to a tree as he waits for the return of his mother who is hunting for food in the wilderness of Ontario, Canada. A baby Black Bear has climbed a tree to stay out of dangers way as his mother searches for food to feed her young in the wild in Ontario, Canada. This is one trait that a black bear learns early in life and they know that high in a tree is a safe place to be until their mother returns. 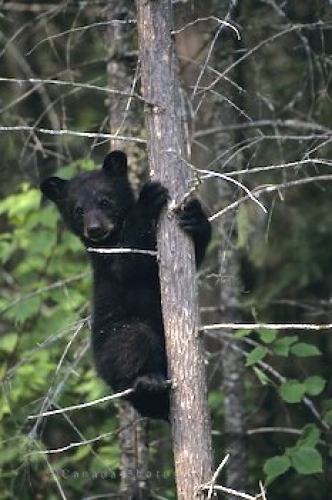 A Black Bear cub in a tree, Ontario, Canada, North America. Picture of a baby black bear high in a tree in the wilderness of Ontario, Canada.